Now that the final weekend of Kentucky Derby 144 preps have taken place, the Wynn Las Vegas future book odds give us a good idea of what we may see on the first Saturday in May. Justify is the prohibitive favorite in Vegas to win the Kentucky Derby. You can get him at the low odds of 5/2 at Wynn, as of April 16, 2018. 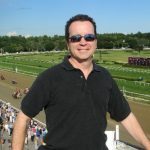 Future Book odds direct from the best racebook in Nevada, Wynn Las Vegas, and racebook manager Johnny Avello. We have received updated Future Book Odds on the Breeders’ Cup Distaff (partial list below) and the feature event, the Breeders’ Cup Classic featuring Triple Crown winner American Pharoah. Click here for the complete list from Wynn Las Vegas. Future Book Odds to win the 2015 Run for the Roses, courtesy of Wynn Las Vegas, the premier horse racing sports book in Nevada. Kentucky Derby 2013 Future book odds courtesy of Wynn Las Vegas are posted on our resource page here. Thank you to John Avello at Wynn Las Vegas for the odds update. Odds updated as of as Jan. 23, 2013.